Miami Dolphins quarterback Ryan Tannehill has not missed a snap despite being sacked a league-high 47 times. DAVIE, Fla. — Ryan Tannehill had just seen his pass intercepted by Pittsburgh’s Troy Polamalu, and the Steelers safety was making a beeline down the sideline. Tannehill joined several teammates in pursuit of Polamalu, who dived and got the ball in the end zone as his knee hit the Miami Dolphins quarterback in the helmet. "I was just trying to stop him from getting in the end zone," said Tannehill, whose Dolphins won at Pittsburgh 34-28 on Sunday despite Polamalu’s Pick 6. "I don’t think about much self-preservation at that point. It’s all about, ‘I messed it up. I screwed it up. So, let me try to stop him and keep him out of the end zone.’"
That one play, and his response to it — both immediate and throughout the game — goes a long way in capturing where Tannehill is in his second season as Miami’s starting quarterback. The mistakes need to be curtailed, but Tannehill’s grit and resilience are why he has many fans among Dolphins coaches and players. "He’s confident. You just look at him and you can tell he’s confident in himself," tackle Tyson Clabo said, "and that’s really the biggest obstacle to overcome from a ‘you’ standpoint. "So when we look at him, we can see he’s confident in himself and that gives us confidence in him." Tannehill’s 3,315 passing yards are 10th-most in the league. He has thrown for 20 TDs and 14 INTs. He hasn’t missed a snap all season despite being sacked a league-high 47 times. Most importantly for the Dolphins, Tannehill has helped lead Miami to a 7-6 record and in the mix for an AFC playoff berth. "He’s very resilient, I’ve said it many times, physically and mentally," said Dolphins offensive coordinator Mike Sherman, who was Tannehill’s head coach at Texas A&M. "He’s gone through a season where he has taken some shots, as we’ve tried to develop our offensive line and backs and our protection. "Here he is, still standing at the end of the season. I don’t know if there’s a lot of quarterbacks who have been able to endure like he has. Mentally, heâs very resilient as well." Tannehill has shown an increased ability to run in recent weeks. He has carried 13 times for 135 yards during the last four games. 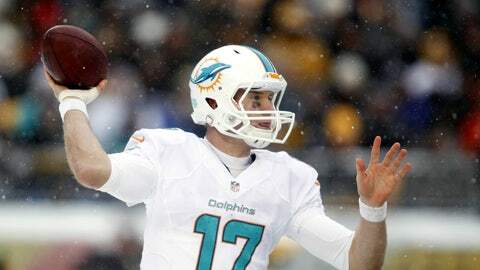 "I think I’m still developing (overall), I don’t think I’m done by any stretch of the imagination," Tannehill said. "If we can add that (running) element into our offense, if it’s something that defenses have to prepare for and can help us win, I’m willing to do it." Dolphins tackle Bryant McKinnie, acquired from Baltimore in late October, said Tannehill’s mobility can be a big asset for the offense. "I realize that’s another dimension he can add to his game," McKinnie said. "And that helps the offensive line, especially the tackles, because that would make defensive ends make sure they have to contain." Some of Tannehill’s recent runs were impromptu and a few were designed, something Sherman refrained from in 2012. "There was a specific reason," Sherman said. "I wanted to make sure that we developed his skills as a quarterback. He’s going to be recognized as a pocket quarterback before heâs going to be recognized in this offense as a running quarterback." Head coach Joe Philbin said he was impressed with Tannehill in his first start as a rookie, when he threw 3 INTs in a loss at Houston. "I think we had 4 turnovers in the first half, and he just came back, business-like and workman-like and approached the second half," said Philbin, adding Tannehill has made strides in year No. 2. "There’s a lot of development that we see, and a lot of it is kind of subtle in terms of play speed, the adjustments maybe people don’t see on film … changing the protection, running the ball in different direction, staying disciplined within that progression and getting the ball out of your hands quick. We’re certainly seeing growth in a lot of those areas."